Have you considered using the cloud? …I know I have. If you read the blurb being written by all and sundry (and now including me) you would be forgiven for imagining that the entire world either lives with its head in the cloud, or is considering doing so in the near future. As I allow myself a limited budget of both time and money for “education” I’m careful what I spend it on. Last Thursday (24th October 2013) I went to the “Cloud Success Roadshow” in Limerick. It was well worth my investment in time. The roadshow is run by a company called Let’s Operate (http://www.letsoperate.com/) and although they show you their products, they definitely didn’t go in for the hard sell. “The Cloud will cost x” (per user/month), but how much does my server actually cost me? For that matter, how much is all that data worth (to me)? Thinking properly about the Cloud will almost certainly make you think very hard about the speed and quality of your broadband connection and your dependence on it. If, like me, you live out in the country and work from home some of the time then this is important. Never mind the quality, a year ago, I lost my broadband when some “eejit” demolished a telegraph pole just down the road! I was sent scurrying down the road to borrow a connection from an acquaintance in order to send a vital eMail reply. I’ve done something about that. There are still a couple of stops planned on the roadshow. If you live in Dublin or Belfast I suggest you consider spending an afternoon there if you have the time. Author Tom GilliesPosted on 2013-10-30 2015-11-13 Categories 2013, Autumn, Cloud, October, OperationsTags cloudLeave a comment on Have you considered using the cloud? Will losing constraints set you free? I have to admit that this is a technical change that I have considered in the past. Never-the-less, I have mixed feelings about it. For many situations a constraint is redundant. The fundamental structure of many applications means they are unlikely to create orphan rows. The cost of the constraint is in the extra processing it causes during update operations. This cost is incurred every time a value in the constrained column is updated. The benefit of a constraint is that it absolutely protects the constrained column from rogue values. This may be particularly relevant if the system has components (such as load utilities or interfaces with other systems) which by-pass the normal business transactions. 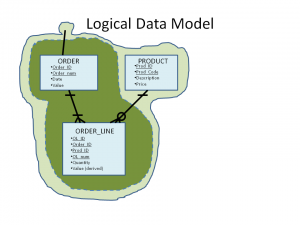 Other benefits of constraints are that they unequivocally state the “intention” of a relationship between tables and they allow diagramming tools which navigate the relationships to “do their thing”. 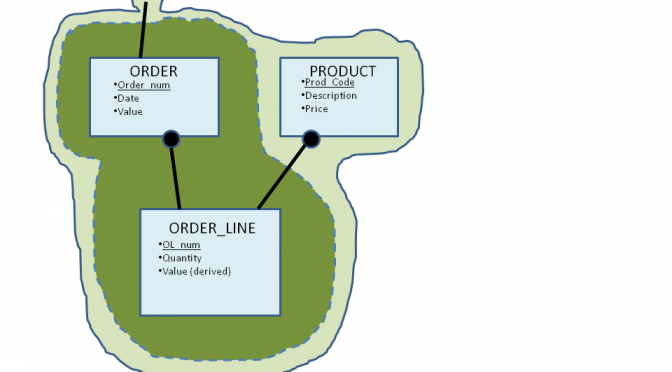 Constraints provide good documentation, which is securely integrated with the database itself. The costs of constraints are small, but constant and in the immediate term. The benefits of constraints are avoiding a potentially large cost, but all in the future. It’s the old “insurance” argument. Make the decision honestly based on a proper assessment of the real risk and your attitude to taking risks. Be lucky! For those who don’t just want to take my word for it. Here is a more detailed argument. Let’s take the “business data model” of a pretty normal “selling” application. in addition we refer to PRODUCT (to get availability and Price) and presumably to the CUSTOMER entity which isn’t shown on the diagram. When I translate this into a Logical data model, I impose an additional rule “Every ORDER must contain at least 1 ORDER_LINE”. The original business model doesn’t impose this restriction. Remember some people do allow ORDERs with no ORDER_LINES. They usually do it as part of a “reservation” or “priority process” which we are not going to try and have here. When the transaction which creates the ORDER and ORDER_LINE makes it’s updates, then it will have read CUSTOMER and ORDER, so it is unlikely to produce orphan records, with or without constraints. On the other hand, by having the constraints we can document the relationships in the database (so that a diagramming tool can produce the ERD diagram (really I suppose that should be “Table Relationship Diagram”)). If we don’t have constraints and we have something other than our transaction which is allowed to create ORDERs and/or ORDER_LINEs (As I said, typically this would be an interface with another system or some kind of bulk load), we have no way of knowing how reliably it does it’s checking, and we might be allowing things we really do not want into our system. Constraints would reject faulty records and the errors they created (or “threw”) could be trapped by the interface. Author Tom GilliesPosted on 2013-10-21 2015-11-13 Categories 2013, Autumn, Data Modelling, Database, Design, Methods, OctoberTags database, DesignLeave a comment on Will losing constraints set you free?